We have been discussed different Angular measuring Instruments so far. Sine Bar is the one of the precision Instrument among those. It will be used along with the Slip gauges in angle measurements. In this article, we are going to discuss the Construction, the working principle, Uses of Sinebar, Formula to determine the angle. 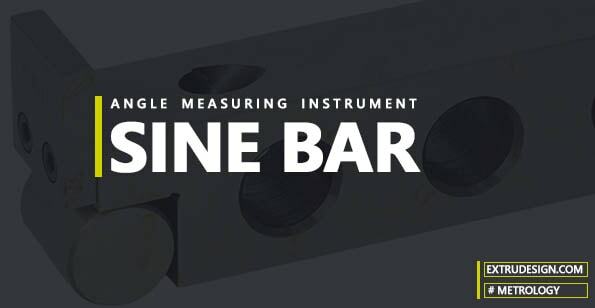 Sine Bar is a Precision Angular measuring Instrument to measure angles and to locate the work or Job piece at a required angle very accurately to machining. We have different types of Sine bars based on the various designs for different applications. We will start with the construction of the simple sine bar. Sine Bar is made up of High Carbon steel, High Chromium(Corrosion resistance), and Hardened. It contains Two rollers with the Steel Bar. The two rollers are very accurate and Highly precise and truly equal in Diameters. When we place the Sine bar on the truly flat surface, The axes of the two rollers are parallel to each other and also parallel to the upper face of the Sine bar. There is the presence of relief holes in the steel bar. (To handle the sine bar easily and also reduces the overall weight. The normal distance between the two rollers usually available in 100mm, 200mm or 300mm. There are two grades in sine bars. A grade, B grade. A grade sine bar is having the accuracy of 0.01mm/m length, B grade sine bar is having the accuracy of 0.02mm/m length. There are various types of sine bars available in different designs for different applications. Let’s discuss the working principle of operation. The principle of operation of sine bar is based on the trigonometry. See the following posture of the Sinebar to set a given angle. As you can see, one Roller is placed on the surface plate and the other one is placed at a height h with the help of slip gauges. Where L is the distance between the two setting rollers of the Sinebar. From this, we can write θ = Sin-1(h/L). This is the formula for sine bar to calculate the angle or to set the workpiece at a required angle. Pretty simple, isn’t it? How to achieve accurate measurements with the Sine Bar? 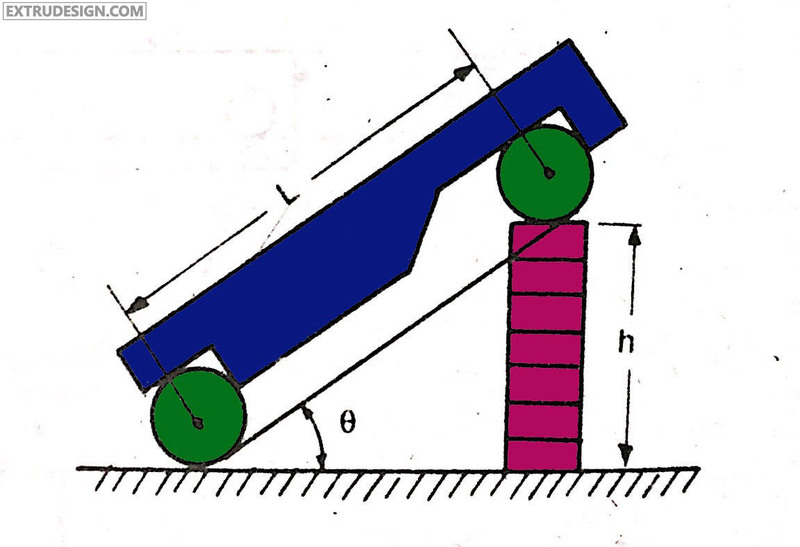 The axes of the Setting rollers must be parallel to each other and parallel to the upper surface of the Bar. The distance between the two rollers must be known value. (Size of the sinebar is determined by this distance only). The flatness of the upper surface of the bar should be truly flat. And it should be parallel to the surface which is contacted to the two setting rollers. The two setting rollers must be equal in diameter and round within very close tolerances. When all these requirements fulfilled by the design of the Sinebar, it can achieve high accuracy measurements. Errors in measurements with Sinebar might be occurred due to any of the above-mentioned requirement is not fulfilled. Those are the source of the errors for the Sinebar measurements. Also with using the improper combination of slip-gauges will also result in an error in measurements with Sinebar. Sine-bar is used to set or locate the workpiece at a given angle. Check the unknown angles on the heavier components. Some specially designed Sine bars are used to mount the workpiece to do the conical shape machining for the workpiece. From all the way We have discussed Construction of Sine-bar, Working principle and operation of Sine-bar, accuracy requirements for Sine-bar, Sources of error in Sine-bar, and different uses of Sine-bar. Please let us know your thoughts in the comments section below that anything we need add. Thanks.